The argument about whether or not video games should be considered art has been going on for decades. Do they truly impact our culture in a meaningful and profound way or are they just simple distractions? In recent years, however, it seems that this debate has begun to swing heavily in favor of the former. Now more than ever people have begun to open their eyes to the amazing artistic potential that video games can provide. Titles like God of War proved that games could deliver a compelling narrative that feels both epic and at times deeply personal. At the same time, they can create complex and interesting characters that rival those of any medium. Others like Red Dead Redemption 2 showed us the ultimate realization of creating a living breathing world, one that feels every bit as lived in and believable as those seen on film or read about in books. While games like Sekiro: Shadows Die Twice have introduced deep and immersive gameplay that forces players to draw on their experience and find the strength to overcome any challenge. Risk of Rain 2 is quite literally NONE of these things...but it is really REALLY freaking fun. 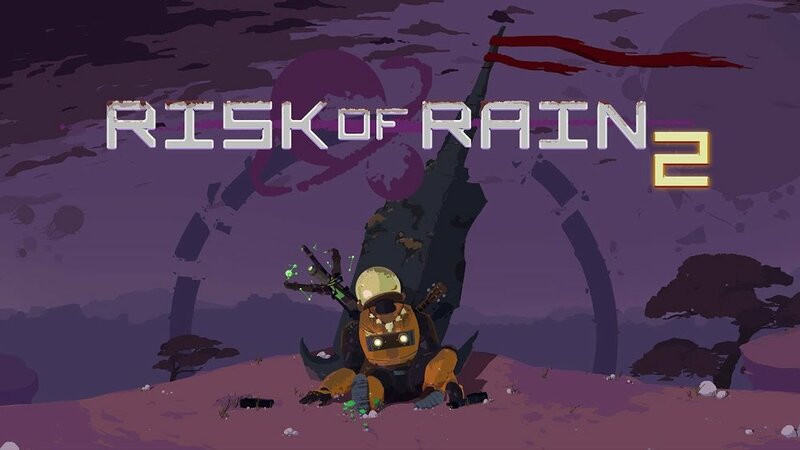 Risk of Rain 2 is (obviously) the currently early-access sequel to 2013’s Risk of Rain — a metroidvania style platformer with roguelike gameplay elements developed by Hopoo Games. This entry however, has foregone this style and instead adopted fully 3D graphics becoming a full fledged shooter. Much like its predecessor, the player is given one life to progress as far as possible through a series of levels, upgrading their character along the way with loot they have gathered. The catch here is that the longer you spend playing the harder the enemies become. While that may seem like it goes without saying, the game does not wait for you to beat a level to increase in difficulty. A dial on the screen is constantly turning, leading to a race between killing enemies, gathering loot, and progressing to the next area. Waiting too long may mean going up against high level enemies with sub par items, but rushing through means missing out on loot and in this game, more than any other in recent memory, LOOT IS KING. The almost ludicrous quantity and variety of items that you can collect in this game is, at times, straight up comical. In the later stages of the game your character is often decked out with equipment to such an insane extent that it feels like you’re playing a completely different game. The progression of your characters appearance from early game to late game can be rather…jarring. The appeal of Risk of Rain 2 is in its simplicity, the premise is straightforward: Shoot enemies, get money, buy loot, rinse and repeat. While this may sound repetitive, as I explained before the beauty is in the sheer variety of items that you can come across, it is doubtful you will ever end up with the same layout twice leading to some absolutely wild combinations of powers for you to experiment with. The simplicity is actually refreshing in some ways, instead of bogging you down with layers and layers of complicated mechanics you are given just a few basic abilities to use. This allows you to focus entirely on buffing the ever-loving crap out of your character instead of memorizing a move list or ability chart. It’s some of the most pure, unrefined fun I have experienced in a video game in years and reminds me of a simpler time when sometimes all you wanted was to experience the joy of being a borderline superhero laying waste to everything in your path. That’s not to say that the game is a cakewalk, far from it in fact. The game becomes exponentially more difficult the longer you play. At the highest difficulty levels powerful enemies begin to spawn at an almost unmanageable rate, and in spite of your seemingly overpowered abilities you still find yourself at a disadvantage. If you’re playing with friends (which you should be) teamwork is critical at this point, as is making sure everyone is getting a fair share of the loot. This brings me to my one semi-critique which is that if you die early during a round you miss out on a ton of experience and items, making it increasingly difficult to close the widening gap and will likely only result in you dying over and over again. Risk of Rain 2 is, for me, the purest distillation of what a video game should be: addicting, highly replayable and, most of all, FUN. It doesn’t have anything particularly unique or exceptional about it in terms of gameplay, narrative, or visuals, and yet you will find yourself sinking hours upon hours into this anarchic sandbox. As the game is still in early access there are currently only 4 maps as well as six playable characters, most of which have to be unlocked. The game was designed to be played either single player or co-op, but playing with friends is highly recommended and basically necessary if you really want to get anywhere. At the moment there is still a large amount of content (maps, items, enemies, and characters) that have yet to be released and which we will likely see introduced in the coming months as the game continues to develop. Usually I have reservations about purchasing early access games since paying for an unfinished product never sat well with me (looking at you PUBG). However, in this case I already feel like my money was well spent on the game, and it’s only partially completed. With how much enjoyment I’ve gleaned from this game so far I sincerely can’t wait to see what else Hopoo Games has in store for the future. To put things into perspective this is just one page of the items you can find so far, there’s still an entire second page filled with ones yet to be made available.